Known for their high-performance flash products, ADATA Technology has recently revealed the new S107 USB flash drive. With its sporty design, this model is shock-resistant, waterproof and offers a new approach to SuperSpeed USB 3.0 interfaces. Flash drives have definitely come a long way since the early 2000s, in both popularity and performance, and ADATA is certainly keeping up with the demand. 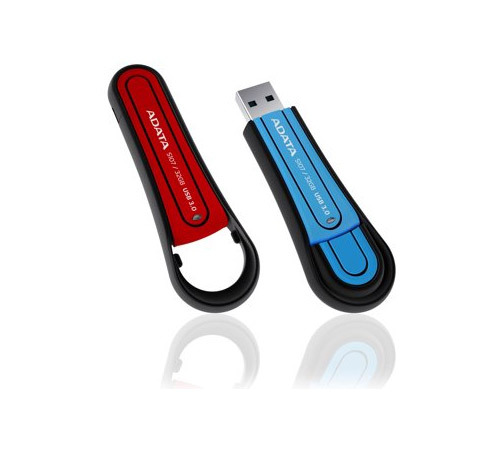 Catering toward the on-the-go and ready-to-take-on-the-world consumer, ADATA’s newest contribution to the USB flash drives industry has a unique silicone rubber exterior which offers military-grade shock-resistant and waterproof capabilities. With such a durable construction, you can trek through the most rugged terrain worry free. Your data will remain safe and in-tact should it accidentally be dropped or spilled on. Though the S107 protects the flash drive from irreparable damage caused by water or electric shock, lab tests have concluded that the drive can withstand a water submersion of up to 1 meter for about 20 minutes. So if white water rafting is your thing, maybe it is best to keep the drive in the truck. The same goes for you electricity enthusiasts of the world, whoever you may be. The ADATA S107 uses the new USB 3.0 interface, which provides read speeds of up to 100MB per second as well as write speeds of up to 50MB per second. This model is currently available in 8GB at $20, 16GB at $30 and 32GB at $65 but comes in only two colors, Scarlet Red and Wild Blue. ADATA is also offering a free 60-day trial download of Norton Internet Security 2012 antivirus software and utility backup software UFDtoGo to eligible purchasers if the S107. Though ADATA has yet to release an official date for the S107 to hit shelves, there are already some mixed feelings about what this new product will actually bring to the table, if anything at all. With so many similar products currently on the market from several credible companies worldwide, what will make ADATA’s model so different from the rest? Is the drive’s physical durability just clever marketing or does it actually deliver in the most extreme conditions? Do you think the cost seems reasonable for what the product claims to offer? Tell us your thoughts! This entry was posted in ADATA S107 USB 3.0 Flash Drive, ADATA Technology, Articles, SuperSpeed USB 3.0, USB 3.0, USB 3.0 Flash Drives and tagged a, ADATA S107 USB 3.0 Flash Drive, ADATA Technology, Adata USB 3.0 Flash Drive, S107, S107 USB flash drive, Shock Resistant USB Drive, SuperSpeed USB 3.0, UFDtoGo, USB 3.0 Flash Drive, Waterproof USB Flash Drive. Bookmark the permalink.